If you haven’t seen the show (Saturday mornings on the CW), we take deserving people/families/couples on a trip of a lifetime. Throughout this season, Tommy Davidson and I have had the honor of witnessing a marriage, multiple vow renewals, help families heal from losses, and give performers a chance of a lifetime to headline a show on board a cruise. As I’ve written before, this has been the most rewarding experience of my life and I would love to give more incredible vacations and make more once-in-a-lifetime memories with awesome people. 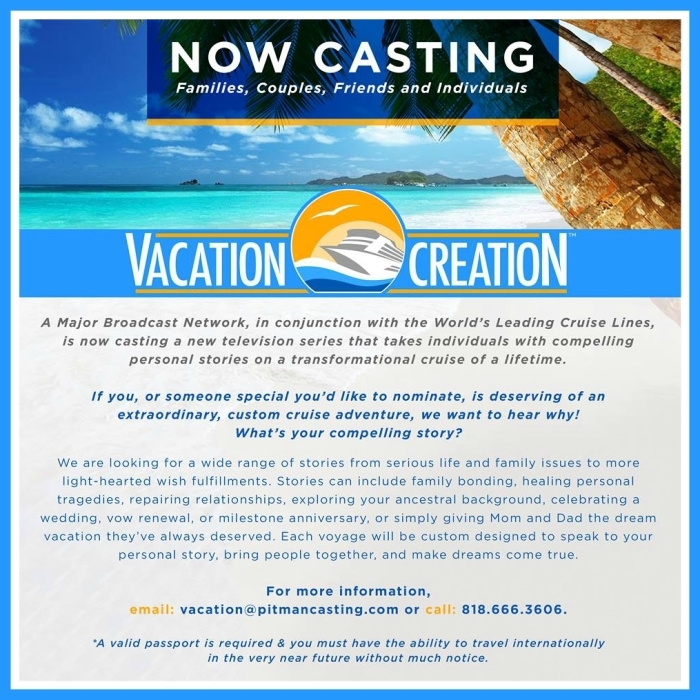 Call, e-mail, or submit here ASAP: https://pitmancastinginc.formstack.com/forms/vacation_show. Hint hint: The casting process is quick! I am so grateful to be surrounded by strong, compassionate, and successful women. These ladies- and many more who are not pictured- have inspired me to be more generous, encouraged me to go bigger with my dreams, and when I needed it the most, assured me that I am enough as I am today. It’s a weird time to be a woman. We are still defining our role. We are told we can’t have it all – or at least at the same time – but our ambition and our drive says that we can defy the thousands of years of cultural precedents telling us that our true role is at home or that we are not equipped to have a seat at the table. But I see examples of women having “it all”, not just on television, but within that very collage. And you have no idea how important it is, when life seems to be throwing every curve ball at you to fail, to have those people in your life to inspire you to move forward. So today, I celebrate women! We have it hard in this world, yet we make it through. There is nothing like a woman’s compassion, loyalty, and support- and we are making this world a better place! P.S. Big shout out to all the boys who support us girls. You are truly loved and needed! It’s where you take a helicopter to the top of a mountain and go down its fresh powder. To put that into perspective, I was above where they let off the explosives for avalanches. Yep, 13,400 feet above the Rocky Mountains and I made it down in one piece. Above is the proof. You know the lyric in America, The Beautiful where it says “For Purple Mountain Majesties”? Well, now I get it. When I was on top of Potosi Peak, the mountains didn’t look white, they looked purple. I thought my perspective was so unique, until our guide politely called me out, saying, “Well, yeah, that’s why they call it purple mountains!” Duhhhhh. So, next time you’re above the Rockies, don’t be me, be the guide, and point out why America, The Beautiful has that lyric. You’re welcome.